Hi-Temp Food Grade™ is a heavy-duty assembly paste designed for high-temp applications in the Food/Beverage and Drug/Cosmetic industries. 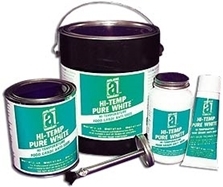 Hi-Temp Food Grade is formulated to adhere to metal surfaces and has anti-rust and anti-corrosion properties vital to protect equipment from harmful attack of corrosive acids found in food substances. Applications: All metal-to-metal surfaces where disassembly is a requirement after exposure to high temperatures, corrosive conditions, or harsh environments.